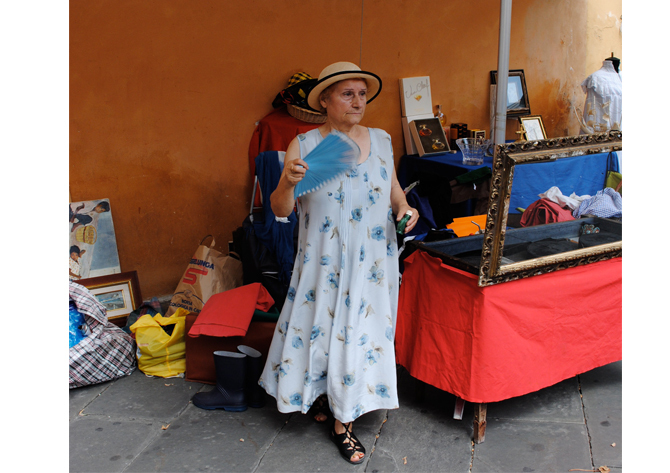 So, back in Lucca at the flea market. 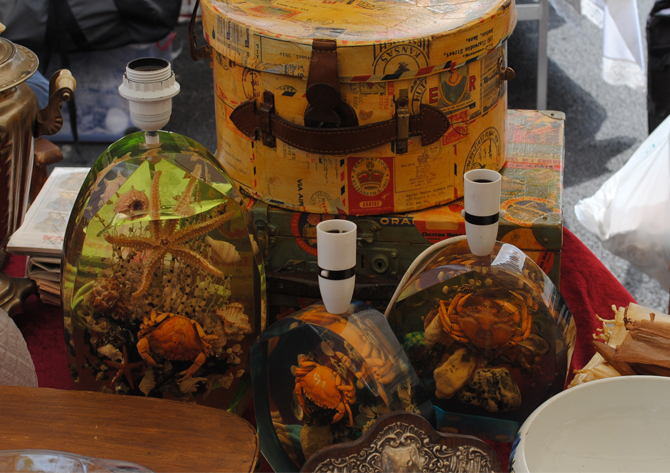 Both stall holders and visitors were a fantastic source of style inspiration, over the next couple of posts I’ll show you a few of my favourites. We’ve had a number of emails from readers recently asking about inspiration for curvier, more generously sized women, so this first post includes a couple of shots on how the Italian’s do it -although Northern Tuscan women do seem to keep quite trim. Above is my favourite vintage clothing stall holder (I want hair like that in another life please), where I bought too many silk scarves and a vintage silk shirt that was pure Marni. I love how she’s added a bit of geometric print and colour to her look with a man’s silk cravat over her fine cotton shirt, also she’s wearing mens-style grey cotton trousers that she has belted. 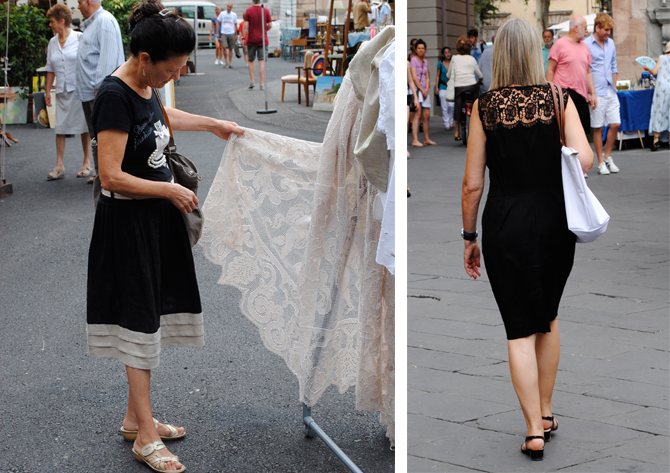 Black -an Italian staple- seems to have been updated this summer with shots of lace or mixing it with white or cream. I loved the heavy pleated ecru hem on the left hand skirt above, and nice sandals tying it all together too. This tiny stall holder was the sweetest, dancing around her stall encouraging everyone to look. You might not want to reproduce her style but I was quite taken with her attention to functional accessories; nan-shoes, school-boater straw hat and fan as well as her floaty floral frock. Also her choice of background wall appealed to the visual merchandiser in me…great colour-pop! A vision in coral pink, this lady couldn’t understand why I wanted to take her photos as she said she had dressed ‘in a rush. I wish I looked so well coordinated when I rushed. Love her knotted approach to keeping the volume of her dress-front under control and the shot of colour and print peeping from under her hem. Also her hair slide is studded with crystals. Bellissimo! 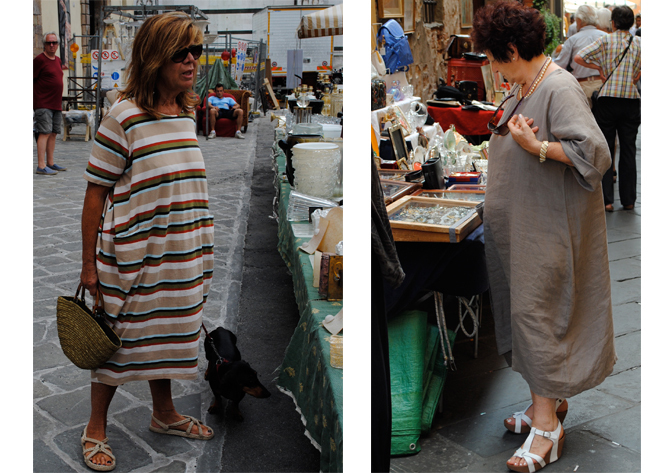 Loved these more generously cut dresses (the striped one on the left is made from comfort-dressing fine terry-towelling) and the great accessories that pull both looks together. 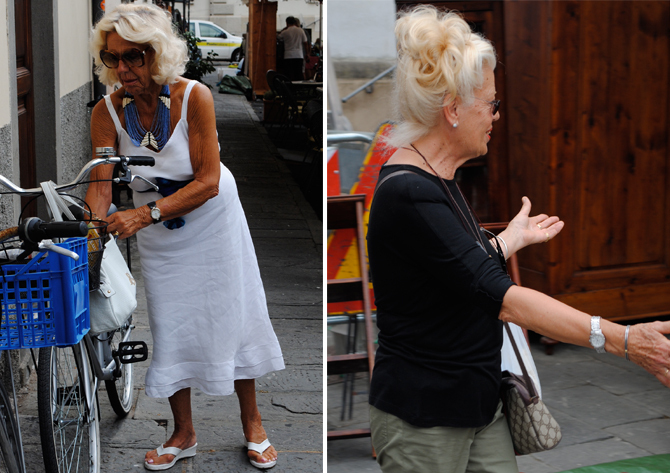 Italians ladies are great at this level of grooming! Nice use of neutrals too. Florals and stripes! Clever to have a single colour floral handbag with a navy stripe dress (on the left above), it makes the whole look so fresh and well thought out. Also, if you are nervous of horizontal stripes, try ’em on the diagonal! 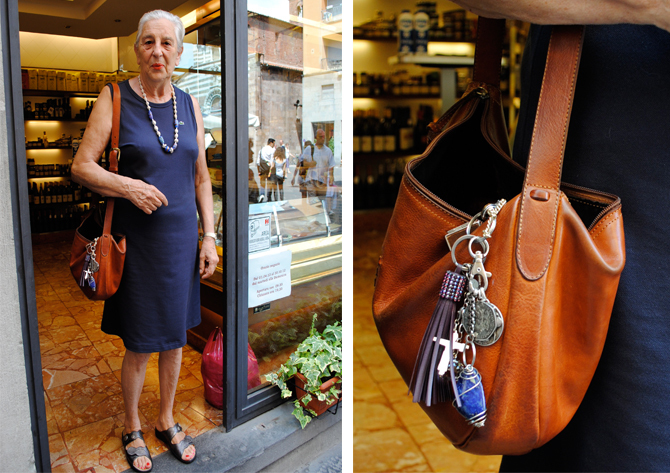 I can’t begin to tell you how utterly GORGEOUS this local Lucca lady (above) appeared, She is the ultimate in italian grooming; sleeked back short silver hair (good cut), vermillion lipstick (matching nails), neat navy Lacoste jersey sundress and a well loved leather handbag that shrieked quality (in a quiet, italian way). The addition of those creatively quirky but expensive -looking danglies on the zip chain keeps the whole look from being too boringly classic. Masterclass in chic. 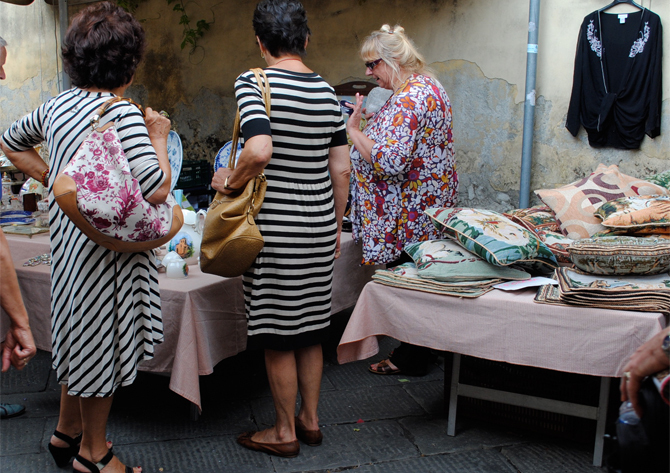 A bit of Advanced Style in Lucca, this look reminded me of Ari Seth Cohen’s ladies. 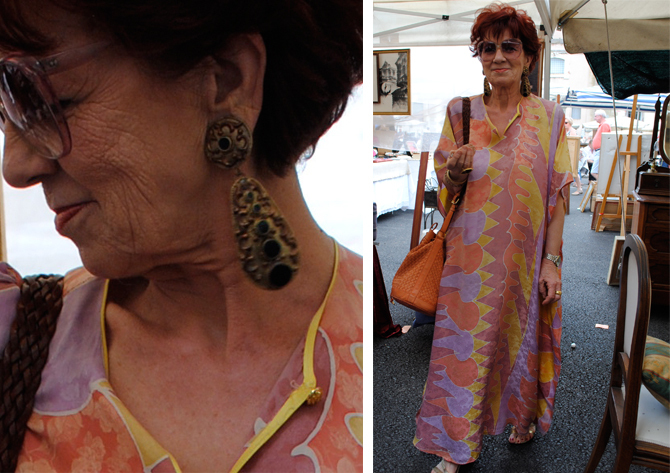 How to wear a maxi over 50 and once again, do not neglect accessories -big earrings rule! Throw in a brightly coloured leather bag if you can afford it too. Blondes having fun….couldn’t resist these two blondes and their big hair. The crisp white sundress in simple white linen is so classic, but the statement blue necklaces makes the whole look rock. Next street shot style post is on Saturday. this is just BRILLIANT, now I understand how I’m going to do it as I get older casual chic dresses ( like the terry towelling one I just bought in me and em’s sale) and ACCESSORIES, Thankyou…. Such stylish ladies. I so want that terri towelling dress!! 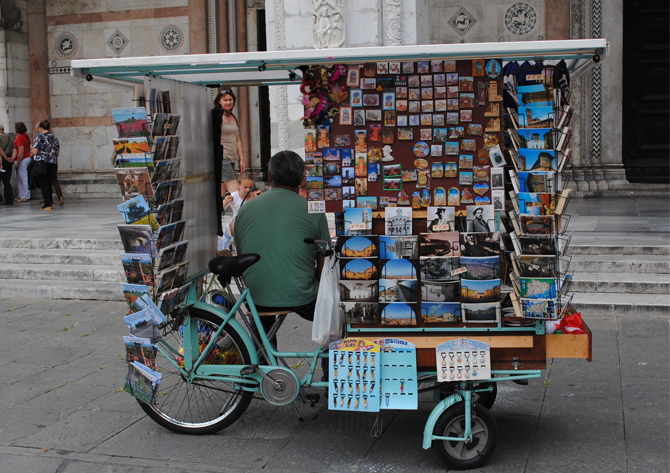 And that bicycle pop up stall! Just think I could cycle a mobile EdwynUK shop around East London!! These real life reports are incredibly cheering. ( and full of good ideas). Thank you for this truly wonderful post. Real women appeal so much more (to me, at least) than models. These are people, with flaws, with personality. Absolutely love it! Very inspiring. Glad you’re liking it ladies! I agree GG everyone looks better with a little colour and the sunshine helps make EVERYONE look happy. Louise, you definitely need to get a mobile retail bike for EdwynUK. Agree…absolutely inspirational both in terms of style and attitude. 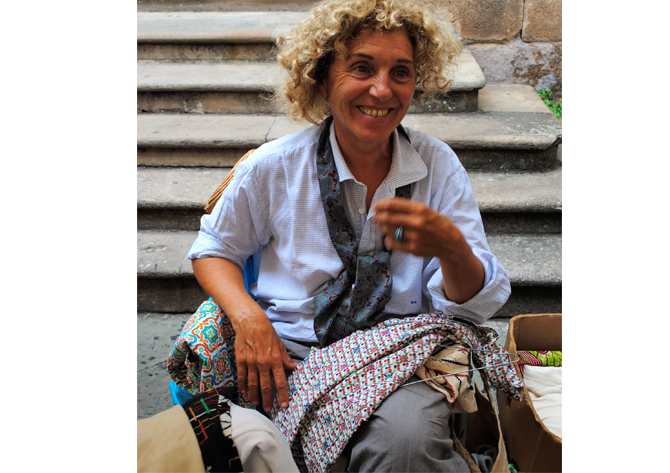 These women look like they enjoy fashion, life and themselves in equal measure. Aren’t they just great – real women, curves and wrinkles and looking amazing. Look M & S these are our role models NOT super skinny Mylene Klass!! You beat me to it Jane. I was just going to comment “bet they don’t shop at M&S”. Great individual looks & Lucca is a place to drool over too! 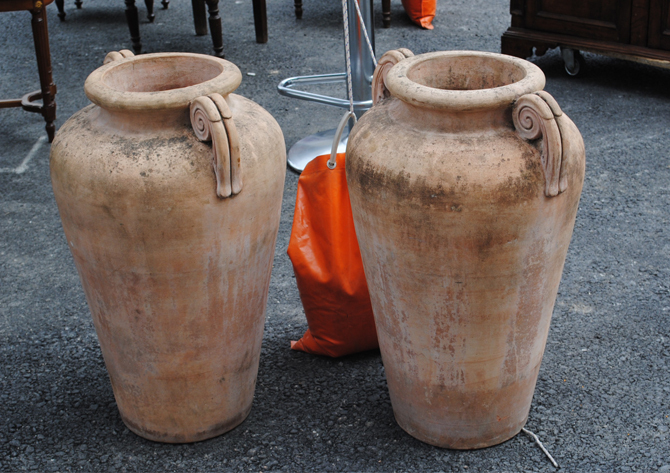 Great photos Amanda, as usual a very popular post! 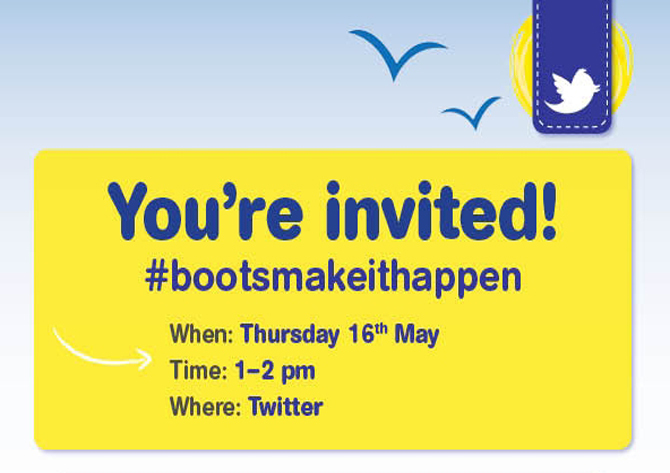 Now, how difficult would it be for M&S to take a note of all these cmmts and act upon them? 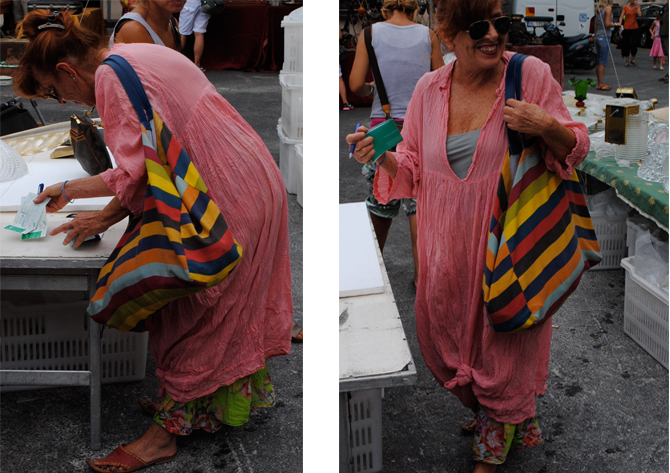 Looking fwd to Saturday’s post, and hoping you can tear yourself away from the pool for another street style photo sesh – now OFF that sun-lounger with you! I will be using this post as a reference. Wonderful! Love, love, love this kind of post, real ladies with comfortable shoes still looking incredibly glamourous. Looking forward to the next similar post. Amazing and just so effortless. Keep up the good work.